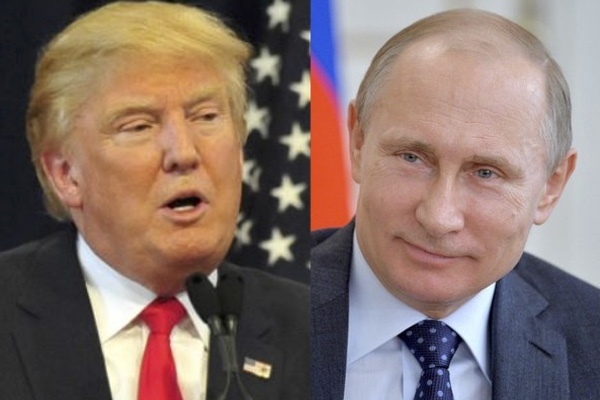 Are Trump and Putin in Cahoots? Americans get indignant when a foreign power seems to be interfering in a presidential election. This year, there is evidence that the Russians may be working to help elect Donald Trump. That could be fatal to his campaign. Just before the Democratic convention in July, e-mails from a database at the Democratic National Committee were hacked and released, supposedly showing that the DNC favored candidate Hillary Clinton over her challenger Bernie Sanders. The FBI indicated it suspects Russians were behind the attack, perhaps to embarrass Clinton. Russian President Vladimir Putin reportedly blames Clinton's role as Secretary of State in encouraging demonstrations against him in 2011. Trump has repeatedly praised Putin, calling him "a strong leader" last December. Trump has questioned the need for NATO, established in 1949 largely to contain what was then the Soviet Union. After the hacked e-mails, Trump publically urged the Russians to find and release to the press e-mails Clinton deleted from her server while serving as Secretary of State. After a storm of criticism, he said he was just kidding. He has said he chatted with Putin, then reversed himself and said he never met or talked with him. In mid-August, news reports surfaced that Trump's campaign manager Paul Manafort had served as a paid consultant to pro-Russian political leaders in the Ukraine. Manafort resigned from the campaign. The Russian factor could become a major issue in the campaign. One indicative historical example of what can happen is perceived British support for Grover Cleveland in the 1888 presidential election. Cleveland, a Democrat, was running for reelection against former U.S. Senator Benjamin Harrison. Cleveland was favored to win. But he was vulnerable to charges of being pro-British because he favored lower tariffs (which would aid British manufacturers) and an amicable settlement of a fisheries dispute with Canada (a former British colony whose foreign policy the British still controlled). In a close election, perceived friendliness toward Britain might be enough to alienate Irish-American voters as well as others who disliked the British. The Republicans found a clever way to exploit those suspicions. Early in September 1888, a California Republican named George Osgoodby, posing as a British expatriate who was now a naturalized American citizen, wrote the British ambassador for election advice. Of the two candidates, which one was better for Britain? The letter writer indicated that he was confused since Cleveland seemed anti-British in the campaign but previously had seemed pro-British. The ambassador, Sir Lionel Sackville-West, should have seen the letter as a trap. Instead, he replied that Cleveland had to maintain an anti-British stance during the campaign but afterward would resume his "spirit of conciliation" toward Britain. The ambassador seemed to suggest that Cleveland favored British interests and also that he was deceitful. Osgoodby took the letter to Republican officials, who kept it under wraps until two weeks before the election, and then released it to the press. The Republicans asserted the letter confirmed that Cleveland was overly-friendly to Britain and had established an "Anglo-Democratic Alliance." Republican speakers fanned out to hammer the message on the campaign trail, particularly to Irish-American voters, that Cleveland was subservient to the British. They mocked Cleveland: "For Canada and for England, No Doubt But What He'll Do/ But America Wants for President an American Through and Through." Sackville-West compounded his blunder through newspaper interviews late in October where he spoke resentfully about American political tricks, questioned the sincerity of both the President and Congress, and defended what he had said in the letter. Cleveland expelled him from the country just before the election. But the damage had been done by then. Cleveland narrowly lost his home state of New York, where thousands of Irish-American voters were convinced that the Sackville-West letter showed Cleveland's pro-British tendencies. By losing New York, he came up short in the electoral college, even though he won the majority of the popular vote nationwide. Harrison became president. The incident suggests a number of things. ● In a close election, evidence of foreign interference can tip the result. The triggering event can be a small one – an ambassador's indiscrete letter or purloined e-mails – which then leads to a broader investigation or magnified controversy. ● A candidate does not have to be closely tied to the offending party to be besmirched; perceptions about a candidate's tariff and fishing policies in 1888, or a candidate's expressions of admiration for a disliked foreign leader in 2016, may be enough. ● Political opponents can be counted on to put a butting-in foreign power in a sinister light. The news media will help keep the issue in the public arena: it is interesting, important, and gets public attention, which in years past meant selling more newspapers, but now means higher traffic on news and social media websites, not to mention the cable news shows. ● When an issue like this surfaces late in the campaign, as in 1888, there isn't much time for the besmirched candidate to respond. But when it surfaces relatively early, as it has this year, there is time for the government, the press and political critics to dig deeper. There is also time for the candidate to disassociate himself from the interfering foreign power. Will Trump do that? If not, particularly if the Democrats can make the case that Trump is Russia's preferred candidate, history suggests that it will almost certainly cost him votes and possibly the election.